Thermography – What Is It? Thermography is the use of infrared imaging and measurement camera to “see” and “measure” thermal energy emitted from an object. Thermal, or infrared energy, is light that is not visible because its wavelength is too long to be detected by the human eye; it’s the part of the electromagnetic spectrum that we perceive as heat. Infrared thermal cameras allow us to see what our eyes cannot by producing images of invisible infrared or “heat” radiation. Nearly everything gets hot before it fails, making infrared cameras extremely cost-effective, valuable diagnostic tools in many diverse applications. Our infrared camera technicians can instantly show you what’s wet and what’s dry. Rapid’s B-2 Infrared camera by FLIR can instantly find the source of water damage with little or no physical disassembly of the premises and minimal disturbance of occupants. The infrared camera is Rapid Recovery Service’s inspection asset for fast, reliable, accurate building diagnosis and estimating from post-catastrophe fire and flood estimates, to diagnosing chronic leaks and moisture problems. Our technicians can accurately locate building moisture issues and track it to the source. This technology allows us to inspect places that can’t physically be reached with moisture meters. Once repaired, Rapid technicians can efficiently and effectively monitor the drying process and confirm when moisture has been eliminated. Infrared cameras can track and easily record current or post-repair restoration conditions — documenting cause and origin data and images. Infrared thermography gives Rapid Recovery Service a definite advantage over our competition. 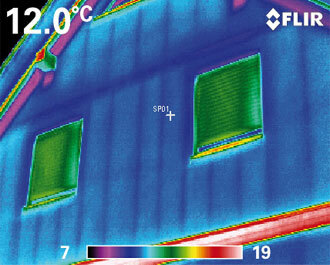 Infrared Technology enables Rapid Recovery to locate problem areas with extreme accuracy, taking the guesswork out of trying to find issues hidden within walls, and ceilings/roofs – saving time and money over traditional visual inspection methods. Rapid technicians can now locate and address heating and cooling losses in residential, commercial and industrial buildings with pinpoint accuracy, enabling not only repairs and adjustments to be made, but accurately verify the work after the repairs. Many residential, commercial and industrial organizations can easily locate and address ways to save money on energy costs through infrared analysis. Rapid can now make Infrared inspections that may be used to inspect and verify heating and cooling systems — for example, to ensure the proper operation of radiant heating pipes located in the flooring to check for crimps in tubing and post-installation validation concerns. Issues with electrical connections, wiring or other system components are clearly highlighted as “hot spots” with infrared imagery — Rapid Recovery Service can easily locate and repair any issues quickly and effectively. Buildings may be quickly and thoroughly scanned via infrared, identifying problem areas that can’t be seen by the naked eye — ensuring the integrity of both structural and environmental systems for building inspection, repair verification, and insurance purposes. Infrared imagery facilitates repairs quickly, easily and safely by minimizing the need for building disassembly, repair time, and labor costs. Rapid Recovery Service’s infrared technicians can easily detect blockages in pipes, which may be quickly located and addressed — enabling immediate response if required. The use of this non-destructive technology provides for proactive action to be taken before the problem worsens and remains a disaster waiting to happen. Infrared cameras in building inspections can even be used for rodent and pest discovery, as their lairs emit heat greater than the surrounding area — a great method to identify yet another hidden problem area when looking to purchase, lease or restore a building. Rapid can fine loose, ill-fitting or disconnected heating, ventilation and cooling (HVAC) system fittings, which can lead to moisture issues and poor building airflow, as well as wasted energy and money!